Top CEOs from top companies came to TNW Conference last month, to share their secrets to success. From the Chinese market to design thinking, we’ve highlighted the biggest takeaways from The Boardroom track. That’s why Ray felt it was time to set the record straight. If you’re a company looking to get into the Chinese market, Ray has some light to shed. According to him, there are several traits of this market that differ from the West. Firstly, everything’s operating at a much larger scale. “There are 1.4 billion Chinese people. If you searched my name in China, I would get lost in the search results,” Ray explained. So everything we do is on a bigger scale, and that has an impact on how we do it. For example, we use QR codes to connect with people on WeChat, because there are too many people with the same name as you. That wouldn’t really happen in the West. Ray also mentioned that big scale means big money. It speaks for itself, but essentially there’s a lot of money to be invested in startups. It also breeds fast innovation. Ray explained that while Chinese companies have a track record for copying Western business ideas, they still produce fresh ideas. These companies, they innovate. They don’t just copy. Maybe they copy at first, but then they do their own thing. And because of the scale, they can innovate much faster than their Western counterparts. When you have so much talent working so hard, it’s impossible to say that they won’t create something really new. With this kind of execution, you can win any market. Ray continues on to discuss how these attributes can lead to companies getting a foot in the Chinese door. He explained three tips to the audience: help them, study them, and join them. Firstly, a local company with reach and distribution can share that knowledge with Chinese startups. “By helping them, you can help yourself,” Ray said. By studying Chinese companies, you can apply a similar model to your company or market. “Facebook already does this, by copying ideas from WeChat and putting them into Facebook Messenger,” Ray explained. Finally, if you can’t beat them, join them. Ray told the audience that getting acquired or getting investments from Chinese companies can be a great solution. “Look at Uber, who sold their market presence in China to the competition,” he said. Ray concluded his talk with just one, very simple, message. “Learn Chinese!” he urged. Bracken spoke to the audience about his experience in turning around a company by implementing design in every part of the process. He began by explaining how Logitech, a company that has done very well by selling PC accessories, began to see a sharp decline ten years ago as PCs became less relevant. We’re an engineering company, and so it was quite scary for our engineers when I came in here talking about becoming a design company. They thought we were going to turn into a fashion company, but that’s not what I meant at all. What Bracken did mean was turning towards a design process first, rather than as an afterthought. So when he became CEO, the first thing he did was hire a head of design. Together, they outlined five principles for the company which became a core value. As Bracken explained, “design is integral to innovation.” He hired industrial designers, UI/UX designers, brand designers, and web designers to get involved in every part of the process. It seems to have paid off for Logitech, as they’re now seeing very steady growth. That being said, it wasn’t always smooth sailing. Bracken explains how in his first year, he saw negative growth rates. “I actually made things worse,” he admitted, but that quickly changed when everyone understood his vision. Bracken described how this success wasn’t just within Logitech — other large companies were turning to design approaches as well, and they all saw increased stock prices. According to Bracken, there are three stages of becoming a design company. The first is when design comes at the end of something. “When it’s a way to make things look better — the decoration slapped on at the end,” he explained. The second stage — which most companies are currently at right now — is when design is on-par and integrated within engineering and sales. The final stage, which Bracken admits that no one is currently at yet, including Logitech, is when design is integrated in every part of the process — from accounting to meetings, and everything in between. This stage is about a rapidly improving, always changing mindset. Constant reflection is the key to design, and that’s what I mean by design at every level. Nobody does this well, except for startups. It’s ironic, really, because everyone looks to large companies to get it right. We don’t know how to do it, we’re looking at startups because they actually have it together. It’s so much easier to implement design at every stage when the whole team can fit around a table. Essentially, Bracken urged large and medium companies to look at small companies to drive their innovation forward. He also spoke to the audience about how design starts as a child, and we need to reconnect with that part of ourselves to make leaps and bounds for the future. Susan outlined five eternal rules of storytelling, which can be used by companies to retain and engage employees. They include looking at core values and ensuring that management embody those principles, and allowing engaged employees to share their experiences. If what you’re promising on the outside doesn’t match the internal reality, you’re creating the perfect storm for employees to leave. She highlighted a few brands who remain authentic, including Patagonia and Cisco. Susan then outlined some best practices for companies who are struggling to retain and engage employees. 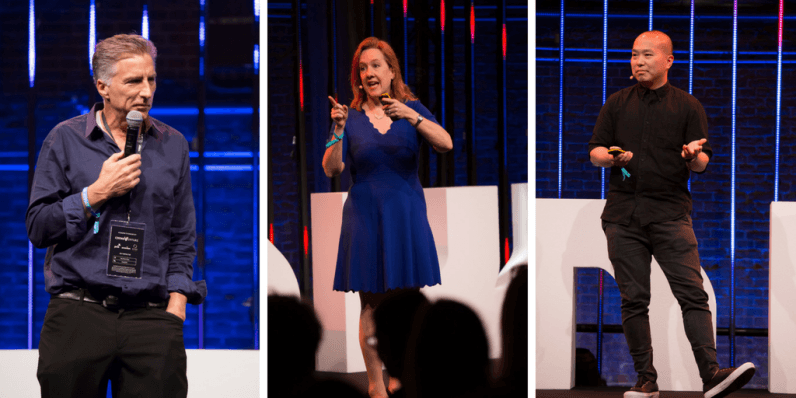 The Boardroom track at TNW Conference saw top executives discuss their secrets to success. We only showed you a few of these amazing talks, so check out the rest of them right here.